Hermès invites you to explore the richness of its home universe. A French maison steeped in history and tradition, Hermès had its humble beginnings first in saddlery and the world of fine equestrian leather goods before moving on to create one of the most iconic and exclusive handbags in the world, the Birkin. However, Hermès isn’t just known for its supple leather goods and quiet ready-to-wear. It represents a way of life and encompasses everything from travel, leisure, automobiles, furniture and homeware that accompany you every day. Since 1837, Hermès has looked at itself as contemporary craftsmen, designing and crafting objects that are aesthetically pleasing, functional and most importantly lend elegance to the daily lives of its customers. Its brand ethos? To incorporate good design with a purpose. This is especially important when it comes to the home objects that Hermès produces. We spend the most amount of time at home, after our places of work, and it would make sense that the brand would want to assist in the curation of the living spaces that we can cocoon ourselves in. Thus, the home universe, aptly titled The Art of Living, was created. As the name suggests, these aren’t merely random pieces of furniture and homeware, but rather, items that grow with you and encompass your lifestyle. The Hermès home universe has been around since the 1920s and The Art of Living is currently under the direction of co-deputy artistic directors Charlotte Macaux Perelman and Alexis Fabry, who have both been with the maison since 2014 and helm the home universe, while collaborating with design industry heavyweights to create home objects and furniture that are bold but still fall within the definition of an Hermès designed piece—items that balance restraint with lightness, tradition and innovation, withstanding the test of time. Through The Walls presents home objects in a way that is quintessentially Hermès—whimsical, poetic, unexpected and full of humour and surprise. 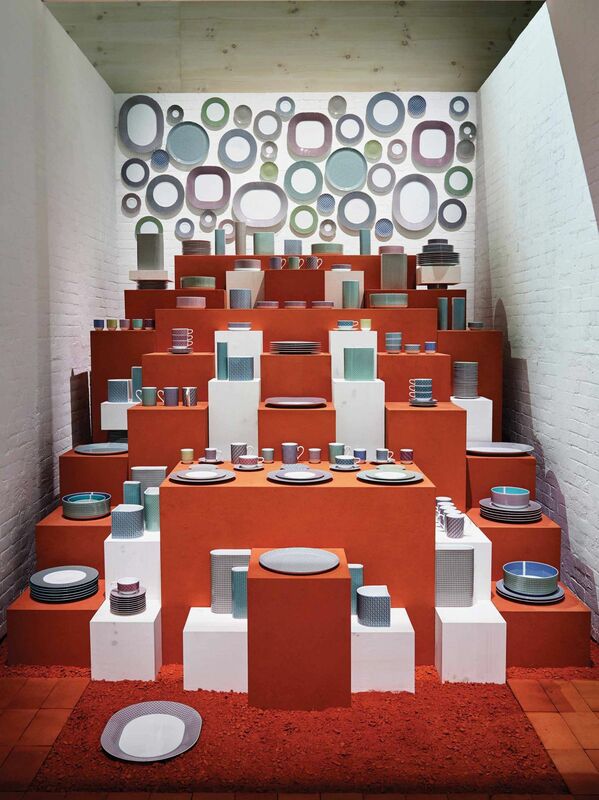 The exhibition aims to showcase to visitors the wealth of items Hermès offers to the discerning homeowner: from tableware, decorative objects and furniture pieces, to bespoke items such as the scarf curiosity cabinet, wallpaper, furnishing fabrics and even lighting fixtures. Like most of its past exhibitions, one can expect an immersive experience that allows visitors to interact with the entire Hermès home universe at its flagship store in Liat Towers. The objects all utilise key materials that are part of the Hermès DNA. Materials such as leather, silk, light maplewood, lacquer and wicker that are all prevalent in the maison’s other departments, enforce the brand identity throughout, showing that while the materials can be used in one way for fashion accessories, they too can be harnessed in another manner for a home object. Take leather, for example. Once used by the maison to dress horses, it is used to dress home objects. Unlike how Hermès leather accessories complement an outfit, leather is used to structure the home objects instead of being mere decoration. As a lid, it completes a box. As a strap, it shapes a vase or holds a case shut. As a bridle, it is utilised as an indoor harness designed to hold, hang or hook. As sheathing, it serves as juxtaposition and adds a layer of warmth and softness to a serving trolley made of wickerwork and wood. Sculptural pieces of furniture will also be on display at the exhibition. There is the Pritzker Prize winner Alvaro Siza‑designed Karumi stool, which is made from bamboo from the famed Arashiyama forest in Kyoto and linked with carbon fibre to retain its structure, resulting in a piece that is light yet durable. Then, there is the Barber & Osgerby-designed Aes coffee table cast in bronze with the look of an industrial girder, but with the finesse of a high-end piece. A key item bound to pique the interest of viewers? The bespoke curiosity cabinets. These exceptional made-to-order cabinets are inspired by the charming disorder of curiosity cabinets of days gone by and are custom-made to fit anything you want, from shoes to a well-stocked bar. Within this vast home universe, it is about the little things as well. Think small maplewood boxes with sheets of leather that work as cardholders, letter racks and any knick-knacks one might have in the office or at home. Vibrant hand-painted lacquer boxes by Italian illustrator Gianpaolo Pagni work as great organisational tools that help hide items and act as decorative pieces any coffee table would be proud to host. Other furnishings include colourful dinnerware featuring micro-motifs of Hermès tie designer Philippe Mouquet, cashmere throws in the house colours, and wallpaper patterns with graphic maze-like designs for adults, and colourful horses for the little ones. Experience the full magnitude of the Hermès home universe in person at the Through The Walls exhibition at its Liat Towers flagship store. From the October 7 to 29, visitors will be able to explore this immersive exhibition and interact with the Hermès objects—from tableware, decorative objects and furniture pieces, to the bespoke scarf curiosity cabinet, wallpapers, furnishing fabrics and even lighting. Admission is free. Check out some of the key pieces from the exhibit here.